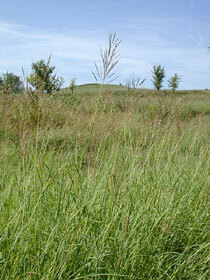 Also Called: Australian bluestem, australian beardgrass. Culms: Erect, slender, solid, glabrous, grooved on 1 side, bearded or glabrous at nodes. Blades: Flat or rolled outward, linear-lanceolate, 2-15 inches long, less than 1/4 inch wide, glabrous, midrib prominent; tips tapered to fine points. Inflorescences: Panicles, elongate, 2.5 to 6 inches long, pale green to purplish, axis longer than branches; branches slender, whorled, sometimes re-branching; rachis joints soft-hairy. Spikelets: In pairs; sessile spikelets perfect, somewhat hairy at bases, slightly larger than stalked spikelets; fertile lemmas with awns 1/2 to 3/4 inch long. Habitat: Waste ground, roadsides, and pastures, more abundant on heavy-textured soils. Distribution: Scattered in east three fourths of Kansas. Origin: Naturalized from Australia and South Asia. Forage Value: Occasionally planted for forage, but of only fair value. Comments: Tufted grass that is invasive and can become a serious weed issue. Tolerates drought conditions. The leaves have a turpentine-like odor when crushed.